So, after fourteen years and six movies, does this disc set bring an end to Peter Jackson's love affair with middle earth? Who knows, but, if it is the case, it's a worthy conclusion, and, along with the other five movies before it, it should be in everyone home collection. It seemed almost inevitable that after his huge Lord of the Rings trilogy, Peter Jackson would turn his attention to JRR Tolkien's other well-known middle earth novel "The Hobbit". What was surprising was that the adaption of this novel would also be a trilogy. Personally, I had reservations, and after seeing the first movie on the big screen, those reservations were upheld. Then came the extended edition Blu-ray, and my enthusiasm for Jackson's telling of Tolkien's work was reignited. Now, with the release of the third and final extended edition Blu-ray, the story is complete. Starting with the company of dwarves looking on as Smaug incinerates Laketown, the camera moves towards the Lonely Mountain where Thorin Oakenshield (Richard Armitage) is going like his father before him, in his search for his birth right - the Arkenstone. He is grappling with his mind; insanity and greed slowly consume him and nothing must stand in his way. Not even the plight of mankind, or the fact that huge armies of various races are converging on his homeland, to fight for the spoils of the treasures once guarded by the mighty dragon Smaug. What ensues is over an hour of fast paced, hectic battlefield action that Jackson made so spectacularly with his rings trilogy, but this time round, it seems much improved. Through all the bloodshed, and there is so much more in this extended edition than the theatrical version, a strain of humanity exists in the shape of a small Hobbit from the shire. The brilliant Martin Freeman as Bilbo Baggins is trying to do the decent thing for all involved, even if it means speaking out against friends or deceiving them. Though, in this final installment, he does play a secondary role. The star of the movie is Richard Armitage and his portrayal of Thorin, seeing him struggle with his internal demons, shaking them off to become a hero who will live on in the songs of future dwarven generations, was a joy to watch. Like the five middle earth movies that have come before "The Battle of the Five Armies", the extended edition disc set adds so much more to the overall story - adding content that was lacking, and in my opinion, the original version was lacking content in certain areas. I'm happy to say those holes have been filled but I can't understand why some of the extra scenes were not included in the first place. If you are one of those rare individuals that has not seen any of the Lord of the Rings movies, there are some nice scenes that splice the two trilogies together and introduces some characters and places. Picture clarity is superb, and added with the DTS-HD sound, it will make you feel like you are in the middle of a battlefield. And, if you are one of those people that love all the extras, you will be happy with over eleven hours of extra content. 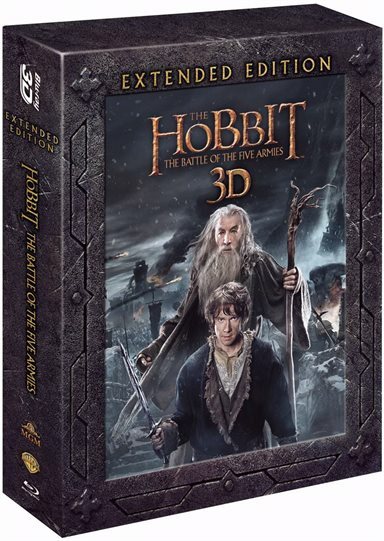 The Hobbit: The Battle of the Five Armies Extended Edition Blu-ray is available to own from November 23rd 2015. Download The Hobbit: The Battle of the Five Armies Extended UK Edition from the iTunes Store in Digial HD.